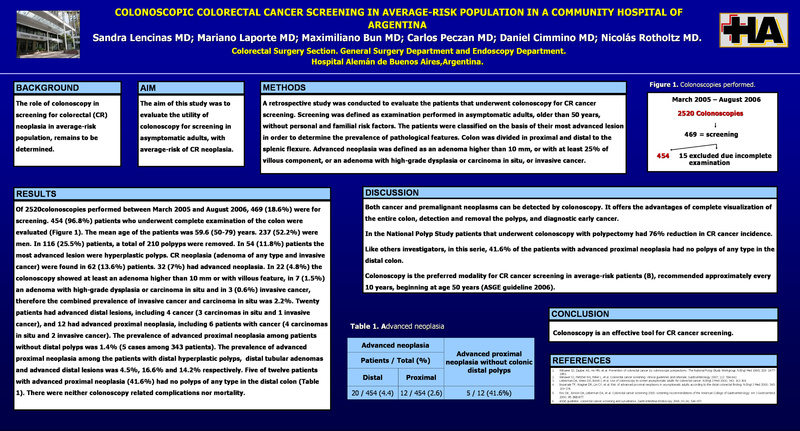 Colonoscopic colorectal cancer screening in average-risk population in a Community Hospital of Argentina. Introduction: The role of colonoscopy in screening for colorectal (CR) neoplasia in average-risk population, remains to be determined. The aim of this study was to evaluate the utility of colonoscopy for screening in asymptomatic adults, with average-risk of CR neoplasia. Methods and Procedures: A retrospective study was conducted to evaluate the patients that underwent colonoscopy for CR cancer screening. Screening was defined as examination performed in asymptomatic adults, older than 50 years, without personal and familiar risk factors. The patients were classified on the basis of their most advanced lesion in order to determine the prevalence of pathological features. The colon was divided in proximal and distal to the splenic flexure. Advanced neoplasia was defined as an adenoma higher than 10 mm, or with at least 25% of villous component, or an adenoma with high-grade dysplasia or carcinoma in situ, or invasive cancer. Results: Of 2520 colonoscopies performed between March 2005 and August 2006, 469 (18,6%) were for screening. 454 (96,8%) patients that underwent complete examination of the colon were evaluated. The mean age of the patients was 59,6 (50-79) years. 237 (52,2%) were men. In 116 (25,5%) patients, a total of 210 polyps were removed. In 54 (11,8%) patients the most advanced lesion were hyperplastic polyps. CR neoplasia (adenoma of any type and invasive cancer) were founded in 62 (13,6%) patients. 32 (7%) had advanced neoplasia. In 22 (4,8%) the colonoscopy showed at least an adenoma higher than 10 mm or with villous feature, in 7 (1,5%) an adenoma with high-grade dysplasia or carcinoma in situ and in 3 (0,6%) invasive cancer, therefore the combined prevalence of invasive cancer and carcinoma in situ was 2,2%. Twenty patients had advanced distal lesions, including 4 cancer (3 carcinoma in situ and 1 invasive cancer), and 12 had advanced proximal neoplasia, including 6 patients with cancer (4 carcinomas in situ and 2 invasive cancer). The prevalence of advanced proximal neoplasia among patients without distal polyps was 1,4% (5 cases among 343 patients). The prevalence of advanced proximal neoplasia among the patients with distal hyperplastic polyps, distal tubular adenomas and advanced distal lesions was 4,5%, 16,6% and 14,2% respectively. Five of twelve patients with advanced proximal neoplasia (41,6%) had no polyps of any type in the distal colon. There were neither colonoscopy related complications nor mortality. Conclusions: Colonoscopy is an effective tool for CR cancer screening.